I am posting as a Chief Waffle Officer. I received a stipend to purchase recipe ingredients, branded products and other promotional items for participating. I will also be paid for the time and effort involved as part of this campaign. The opinions expressed are my own. I’m so excited to share today’s recipe for Fruit Kebabs! We’ve already had fun this week with waffles with a cinnamon waffles breakfast, PB&J lunch, and a yummy Sundae, too. Today’s recipe is a fun and versatile recipe that can be used for breakfast, lunch, snack or even as a treat! 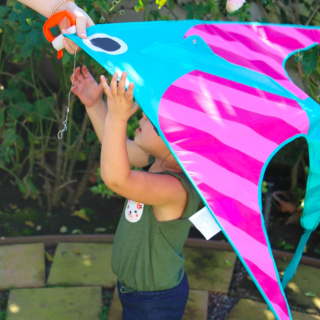 We make these for a snack since they are filling and a fun activity in one! Variety of Diced Fruit. Pick 4-6 favorites. 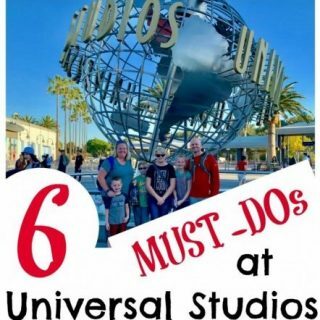 Here are some you might include: Pineapple, Strawberries, Blackberries, Grapes, Cantaloupe, Bananas, Apples, Blueberries, Raspberries, Mandarin Oranges, Watermelon, Mangoes, Kiwi, Pears, or others. Prepare and cut all fruit you’d like to include. Cut cheese into cubes or thick slices cut into flat squares. Toast Eggo Waffles according to package directions. When toasted, cut in half and then cut each half into three slices to make triangles. Load all ingredients onto a platter so they are easy to access and see. Load up the skewers with each persons favorite choices! We had so much fun creating our Fruit Kebabs! This was by far my boys favorite recipe we’ve created out of our week of waffles recipes! 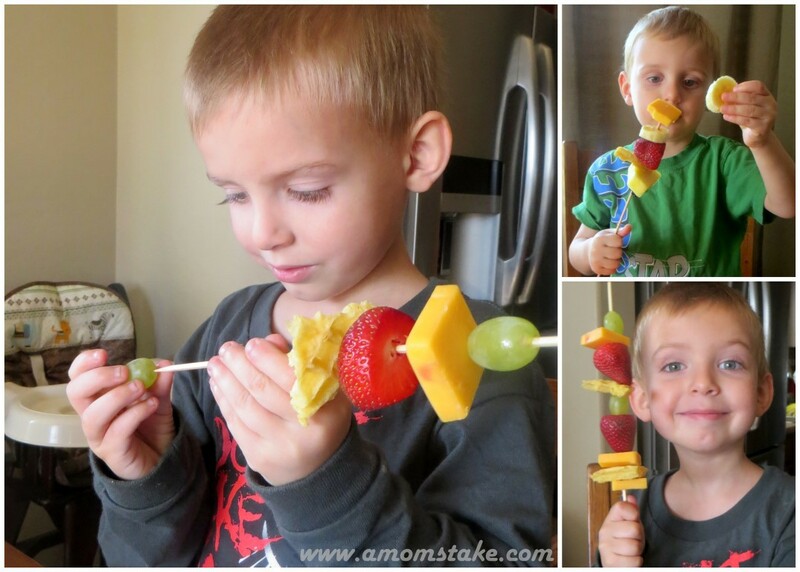 They had so much fun picking out their favorite fruits and making their own fruit skewers. 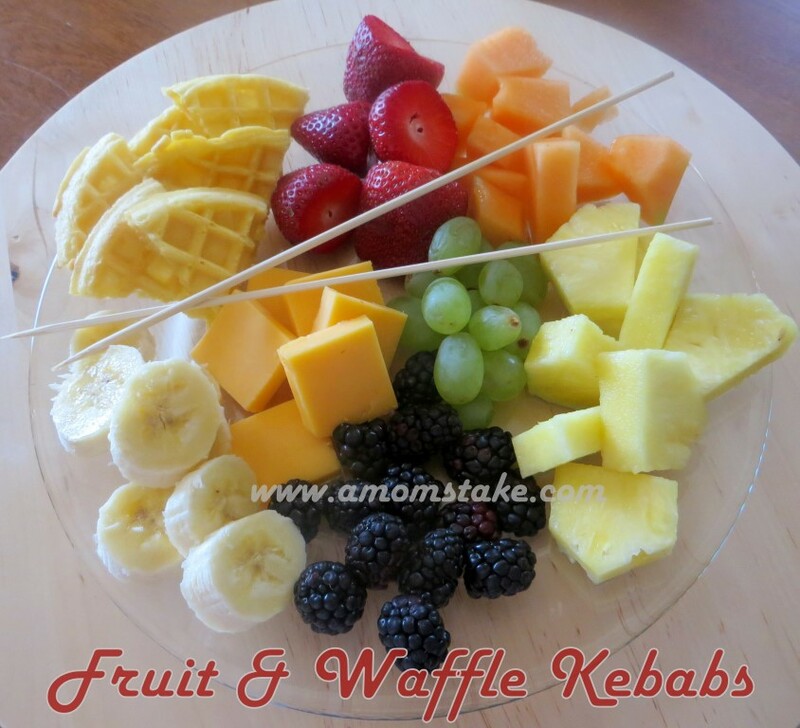 The waffles were a really fun addition to our kebabs and the kids really loved including them with the fruit. You can put the skewer through the middle of the triangle or thread it through along the grid lines of the Eggo and it will hold really well without ripping. Playing with food is a great way to teach your children as it gives them a hands on way to practice and learn. 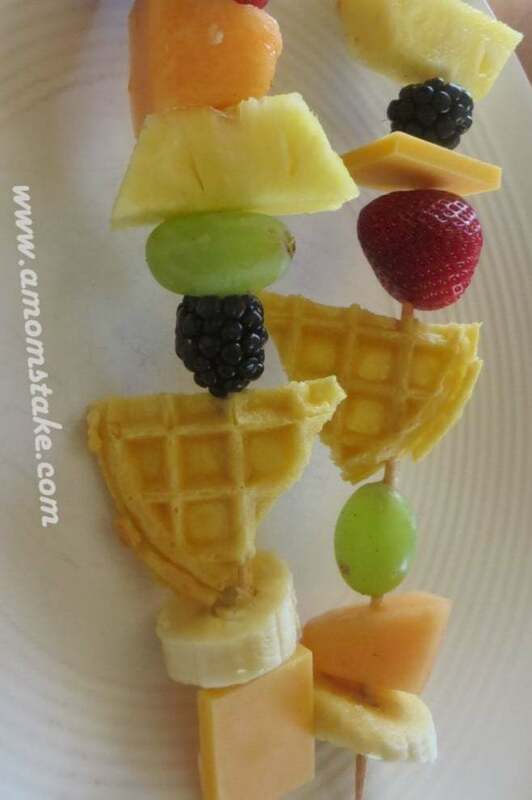 This Waffle & Fruit Kebabs recipe can be the perfect platform to use to teach colors, shapes, pattern creation, counting, and other early education skills. 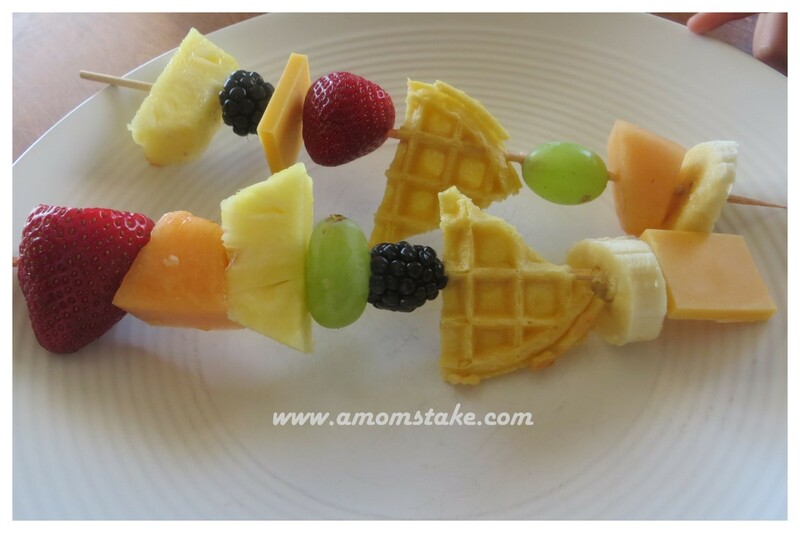 Try challenging your child to find a certain colored fruit to add to their skewer. Or, look for shapes as they play. We had a variety of shapes from triangle waffles, trapezoid pineapple cubes, oval grapes, circle bananas, square cheese, and others! Older children can create their own patterns by practicing ABAB, ABC, or even more complex patterns. Prepare and cut all fruit you'd like to include. Lay all ingredients onto a platter so they are easy to access and see. 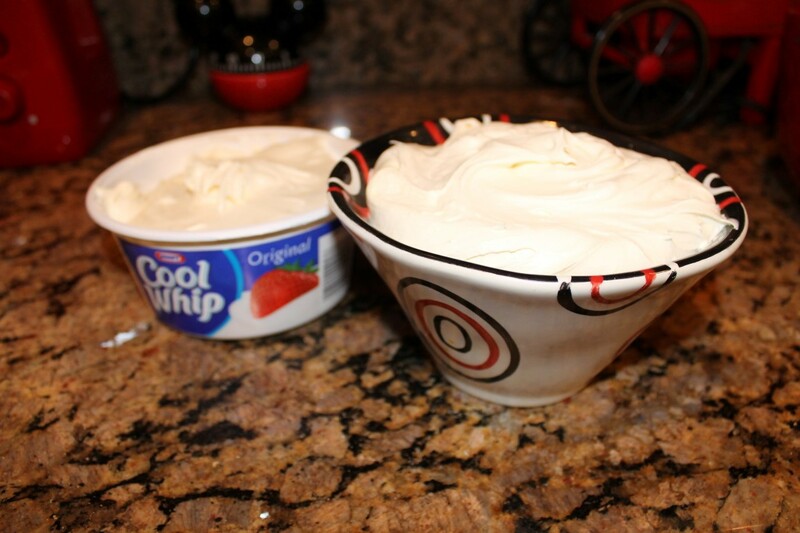 For more fun with your fruit, try this Fruit Dip Recipe! waffle a bobs, that’s about as creative as i get, LOL! Leave a comment with a creative name for this Eggo Recipe! How about: Stick To It Fruity Waffle Breakfast! Anykine fruit ‘n waffle stick! 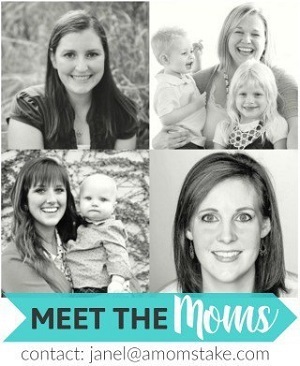 I don’t have a creative name, but I love the idea. 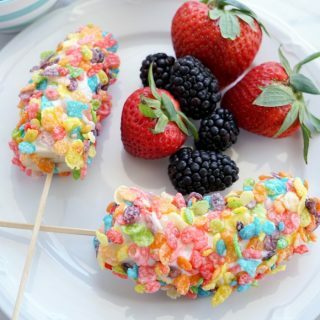 Fruity fun on a stick. Oh my gosh, this is FUN and so up my alley because I love eating fresh fruit like that and serving it to the kids that way! Fruffle, not inventive I know but I am dreadful with this sort of thing. Fruity Eggo on a Stick? Ooh That looks very yummy! My daughter made some of these last week and they are yummy! Yummy, what an amazing idea! Brilliant! 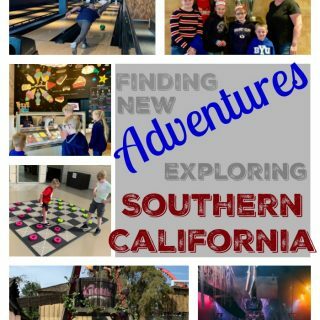 I so need to try this, my son would love love this! i would love a kebab right now! I had the same problem being creative! I love your Eggo-Fruit-Kabobs! My son is going to LOVE these! I can’t wait to surprise him with these. I hope he loves them as much as my boys did!